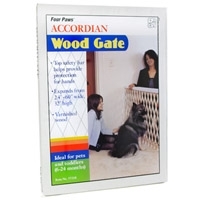 Solvit’s PupSTEP Wood Stairs offer a beautiful and convenient alternative for helping pets reach their favorite places. The sturdy construction and rich walnut finish means these stairs can be proudly displayed in any home. 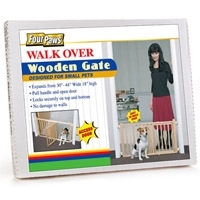 If needed, these stairs can be folded flat for convenient storage or transport. 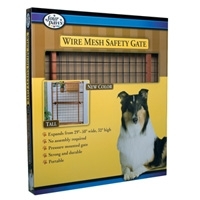 Safety side rails are built into the design so your pet can climb up and down with confidence. No assembly required. Our most economical ramp and the lightest full-size ramp on the market! Weighing in at a "feather-light" 10 lbs, the Bi-fold Ramp still supports over 200 lbs. 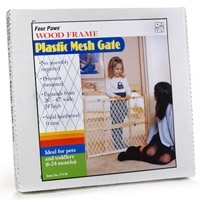 Its rugged, all-plastic construction and simple, folding design make it cinch to use. 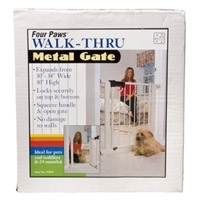 The ramp also includes a safety release latch to prevent accidental opening, and four rubber feet for sure footing. The walking surface is the same high-traction material found on our other ramps. Solvit’s PupSTEP + Plus pet stairs are an attractive, affordable way to help pets reach their favorite places. 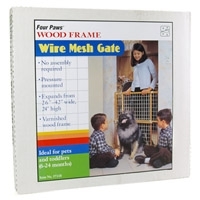 This safety gate features a top safety bar to provide protection for hands or animal's paws. 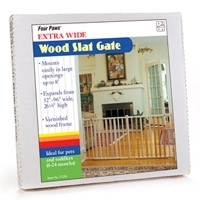 This varnished wood gate mounts to wall openings with included hardware.